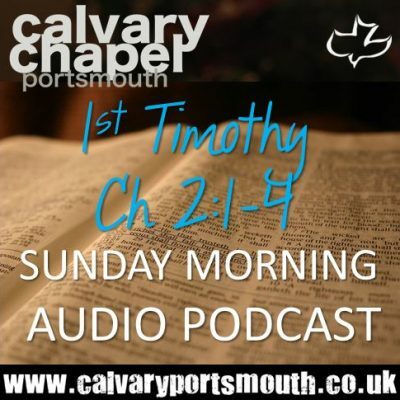 This teaching on 1 Timothy 2:1-4 was given by Pastor Barry Forder at Calvary Chapel Portsmouth’s family service on 10th February 2019. We now began to look at Paul’s instructions to Timothy regarding men and women in the church. Men must not be militant ‘political activists’ be willing to be under the authority of government and laws of the land. In contrast, Woman must be willing to be under the authority of their husbands. Both men and women in the church then, by their lives and actions show their willingness to submit to earthly authority as a practical and outward sign that they are willing to submit to heavenly authority. Paul explains the reason for this is that it is not only pleasing to God, it also becomes a witness to the world, that thereby others may be saved. We begin to see unfolding here how important our attitudes are in winning other souls to Christ. Yes, these views seem outdated to the world, they do not understand the concept of submission. But far from rolling over and being a ‘doormat’ for others to walk all over, we show by our willingness to submit a real strength and trust in God’s order and His plan. May this study bless and encourage you in your walk with Him.